In addition to being US (and Canadian!) title pages from county map and atlas books, the images below were selected for their wonderful 19th century decorative lettering. Many of these works were created in Philadelphia, the printing capital of the world for a few decades up to start of the 20th century. The images themselves were sourced from the magnificent David Rumsey Map Collection and have been background cleaned to varying, but significant, extents. Click through to much larger versions, but the source site has enormous MrSid^ (.sid)* image files available for download. 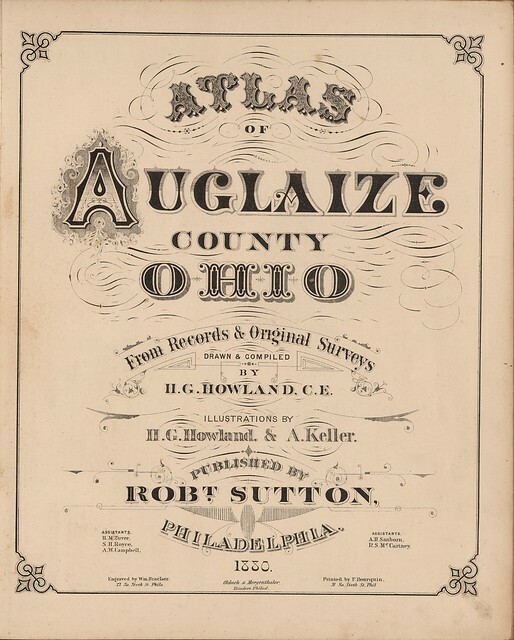 Atlas Of Auglaize County Ohio From Records & Original Surveys. Drawn & Compiled By H.G. Howland, C.E. Illustrations By H.G. Howland & A. Keller. Published By Robt. Sutton, Philadelphia. 1880. Assistants. R.M. Zuver, S.H. Royce, A.W. Campbell ... A.H. Sanborn, R.S.McCartney. Engraved by Wm. Bracher, 27 So. Sixth St. Phila. Oldach & Mergenthaler, Binders Philad. Printed by F. Bourquin, 31 So. Sixth St. Phil. 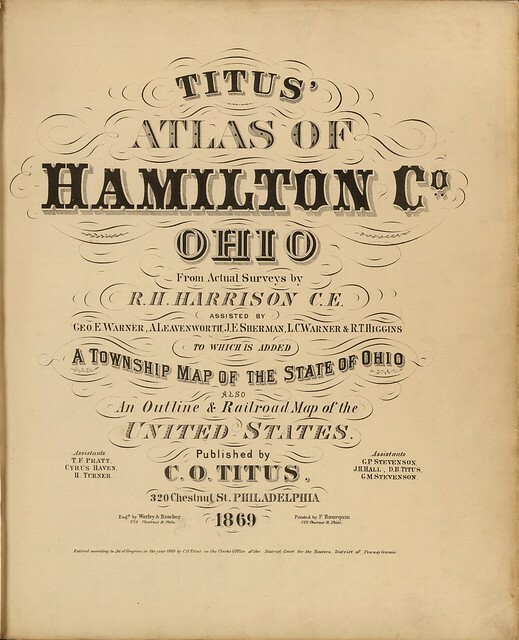 Titus' atlas of Hamilton Co., Ohio from actual surveys by R.H. Harrison, C.E. Assisted by Geo. E. Warner, A. Leavenworth, J.E. Sherman, L.C. Warner & R.T. Higgins, to which is added a township map of the state of Ohio. Also an outline & railroad map of the United States. Published by C.O. Titus. 320 Chestnut St., Philadelphia, 1869. Assistants T.F. Pratt, Cyrus Haven, H. Turner, G.P. Stevenson, J.H. Hall, D.B. Titus, G.M. Stevenson. Engd. by Worley & Bracher, 320 Chestnut St., Phila. Printed by F. Bourquin, 320 Chestnut St., Phila. Entered ... 1869 by C.O. Titus ... Pennsylvania. 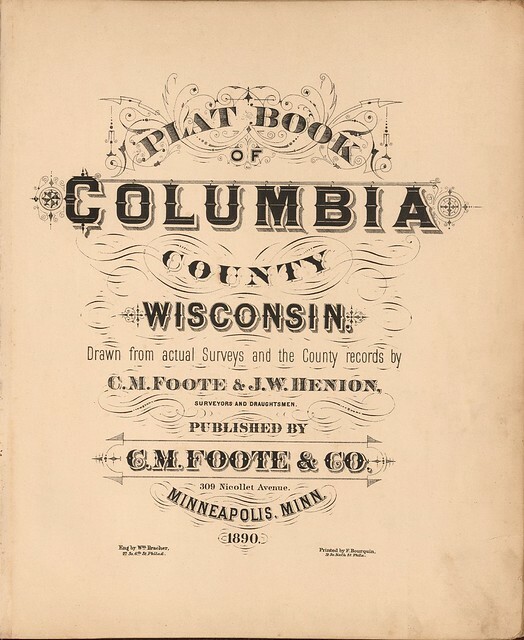 Plat Book Of Columbia County Wisconsin. Drawn from actual Surveys and the County records by C.M. Foote & J.W. Henion, Surveyors And Draughtsmen. Published By C.M. Foote & Co. 309 Nicollet Avenue. Minneapolis, Minn. 1890. Eng. by Wm. Bracher, 27 So. 6th St. Philad. Printed by F. Bourquin, 31 So. Sixth St. Phila. 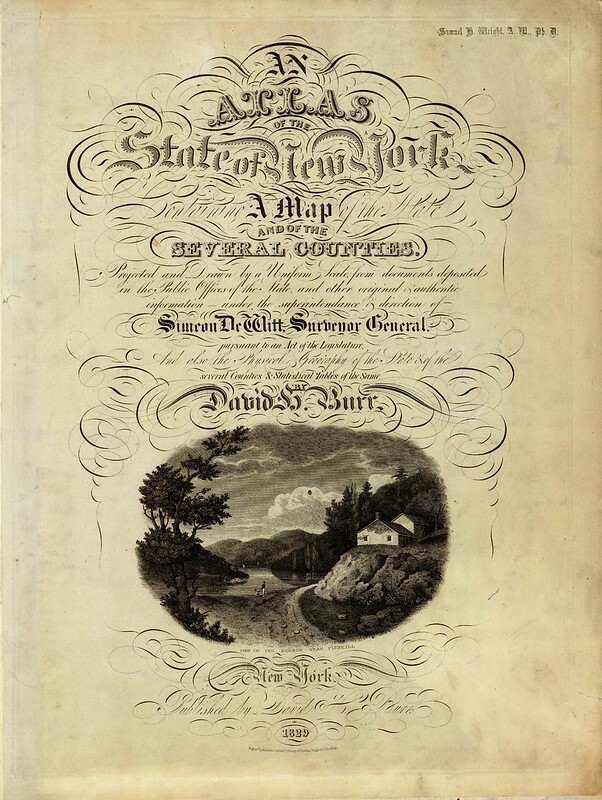 An atlas of the State of New York, containing a map of the State and of the several counties ... under the superintendance & direction of Simeon DeWitt, Surveyor General, pursuant to an Act of the Legislature, and also the physical geography of the State & of the several counties & statistical tables of the same, by David H. Burr. (with) View on the Hudson near Fishkill. New York, published by David H. Burr. 1829. Engravd. by Rawdon, Clark & Co. Albany & Rawdon, Wright & Co., New York. 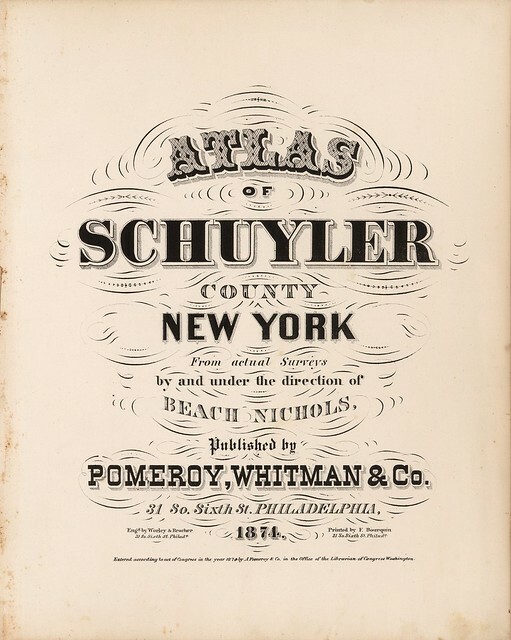 Atlas Of Schuyler County, New York. From actual Surveys by and under the direction of Beach Nichols, Published by Pomeroy, Whitman & Co. 31 So. Sixth St. Philadelphia, 1874. Entered ... 1874 by A. Pomeroy & Co. ... Washington. Engd. by Worley & Bracher, 31 So. Sixth St. Philada. Printed by F. Bourquin, 31 So. Sixth St. Philada. 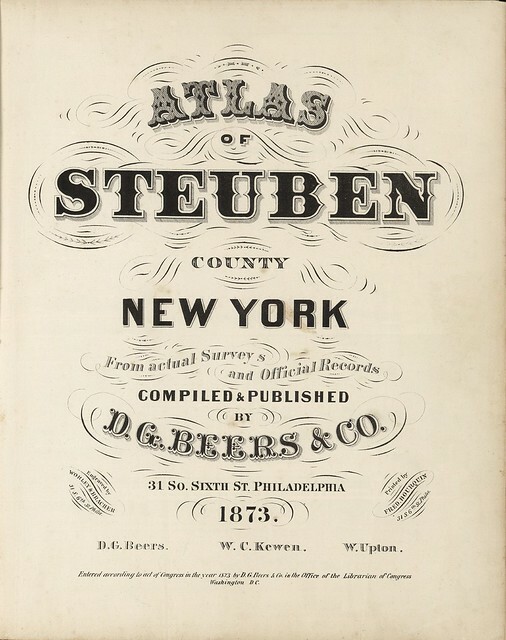 Atlas Of Steuben County, New York. From actual Surveys and Official Records Compiled & Published By D.G. Beers & Co. 31 So. Sixth St. Philadelphia. 1873. D.G. Beers. W.C. Kewen. W. Upton. Entered ... 1873 by D.G. Beers & Co. ... Washington D.C. Engraved by Worley & Bracher, 31 S. 6th St. Phila. Printed by Fred. Bourquin, 31 S. 6th St. Phila. Entered ... 1873 by D.G. 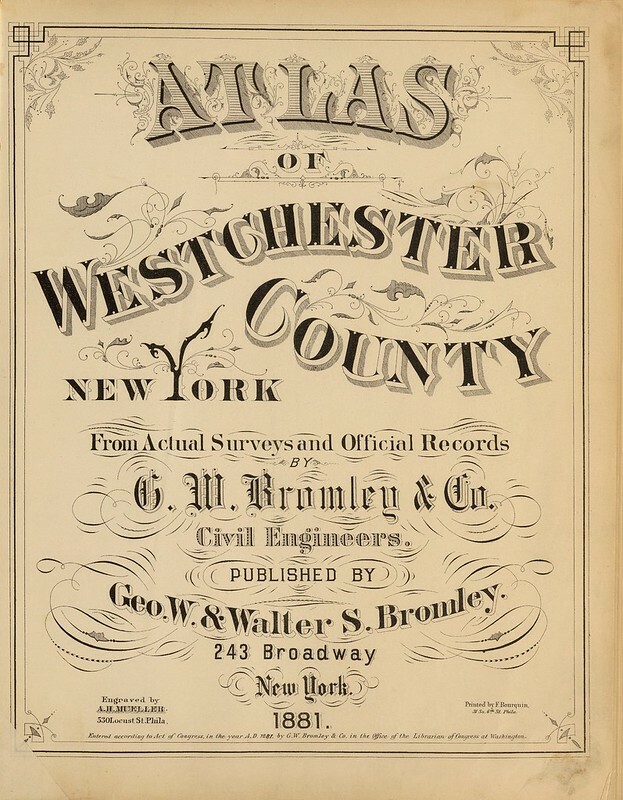 Beers & Co. ... Washington D.C.
Atlas of Westchester County, New York. From actual surveys and official records by G.W. Bromley & Co., Civil Engineers. Published by Geo. W. & Walter S. Bromley. 243 Broadway, New York. 1881. Engraved by A.H. Mueller, 530 Locust St., Phila. Printed by F. Bourquin, 31 So. 6th St., Phila. Entered ... 1881, by G.W. Bromley & Co. ... Washington. 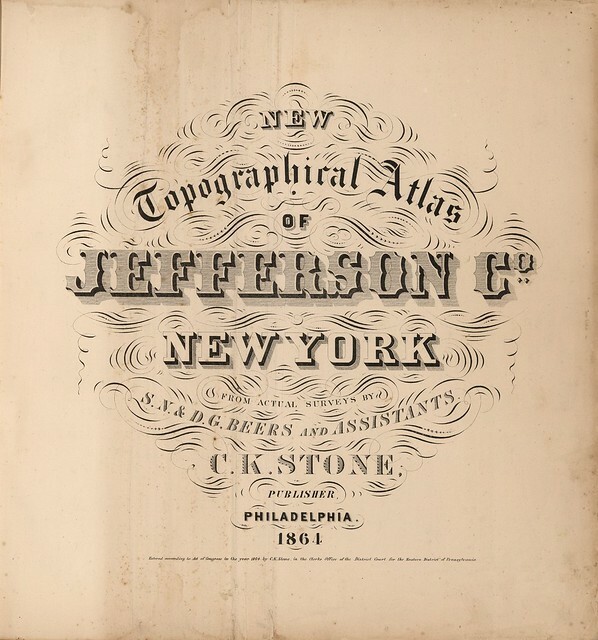 New Topographical Atlas of Jefferson Co. New York From Actual Surveys By S.N. & D.G. Beers And Assistants. C.K. Stone, Publisher, Philadelphia. 1864. Entered ... 1864 by C.K. Stone ... Pennsylvania. 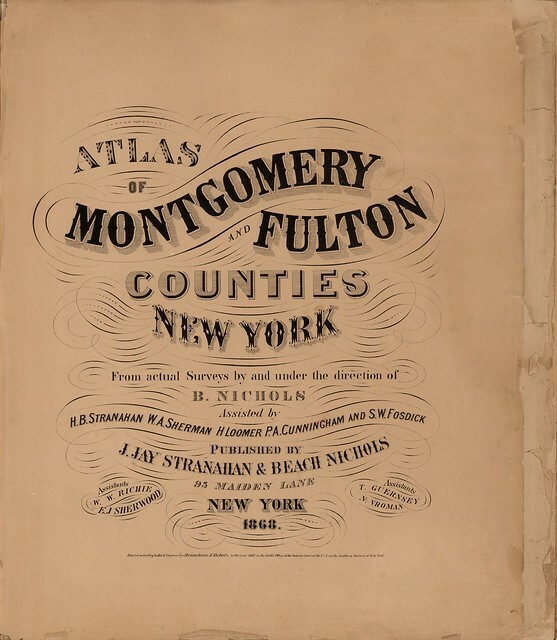 Atlas Of Montgomery And Fulton Counties, New York. From actual Surveys by and under the direction of B. Nichols. Assisted by H.B. Stranahan, W.A. Sherman, H. Loomer, P.A. Cunningham And S.W. Fosdick. Published By J. Jay Stranahan & Beach Nichols, 95 Maiden Lane, New York. 1868. Assistants, W.W. Richie, E.J. Sherwood. Assistants, T. Guernsey, N. Vroman. Entered ... Stranahan & Nichols in the year 1868 ... New York. 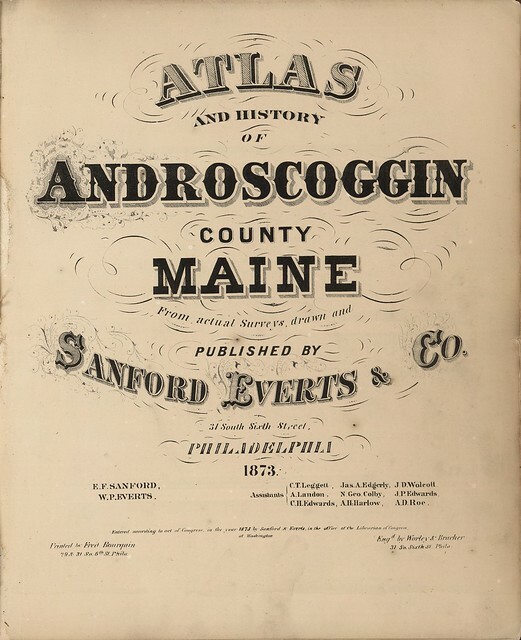 Atlas And History Of Androscoggin County, Maine. From actual Surveys, drawn and Published By Sanford Everts & Co. 31 South Sixth Street, Philadelphia, 1873. E.F. Sanford, W.P. Everts. Assistants: C.T. Leggett, Jas. A. Edgerly, J.D. Wolcott, A. Landon, N. Geo. Colby, J.P. Edwards, C.H. Edwards, A.H. Harlow, A.D. Roe. Entered ... 1873 by Sanford & Everts ... Washington. Printed by Fred. Bourquin, 29 & 31 So. 6th St. Phila. Engd. by Worley & Bracher, 31 So. Sixth St. Phila. 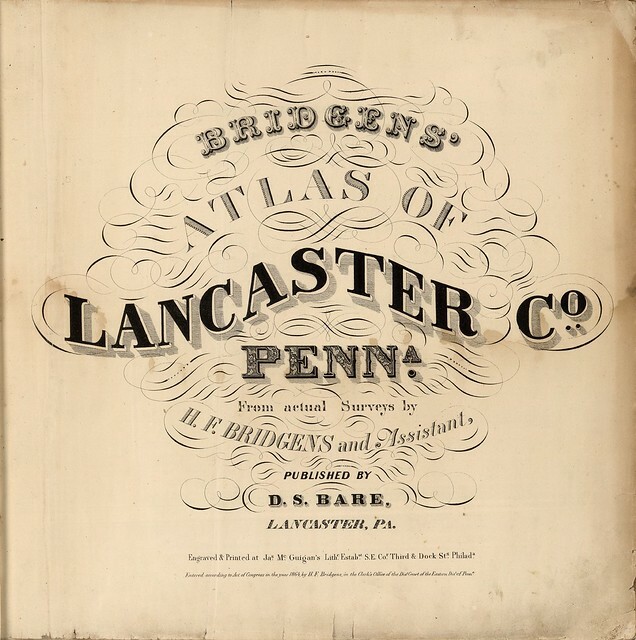 Bridgens' Atlas Of Lancaster Co., Penna. From actual Surveys by H.F. Bridgens and Assistants, Published By D.S. Bare, Lancaster, Pa. Engraved & Printed at Jas. McGuigan's Lithc. Estabnt. S.E. Cor. Third & Dock Sts. Philada. Entered ... 1864, by H.F. Bridgens ... Penna. 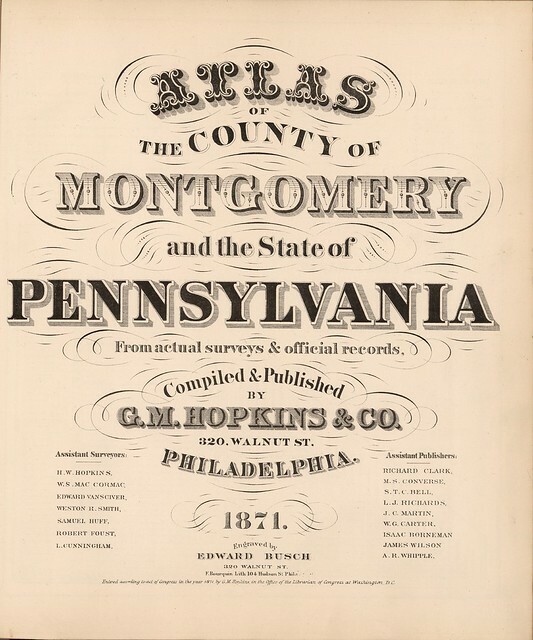 Atlas Of The County Of Montgomery and the State of Pennsylvania From actual surveys & official records, Compiled & Published By G.M. Hopkins & Co. 320 Walnut St, Philadelphia. 1871. Assistant Surveyors: H.W. Hopkins, W.S. MacCormac, Edward Vansciver, Weston R. Smith, Samuel Huff, Robert Foust, L. Cunningham. Assistant Publishers: Richard Clark, M.S. Converse, S.T.C. Bell, L.J. Richards, J.C. Martin, W.G. Carter, Isaac Borneman, James Wilson, A.R. Whipple. Engraved by Edward Busch, 320 Walnut St. F. Bourquin Lith 104 Hudson St. Phila. Entered ... 1871, by G.M. Hopkins ... Washington, D.C. 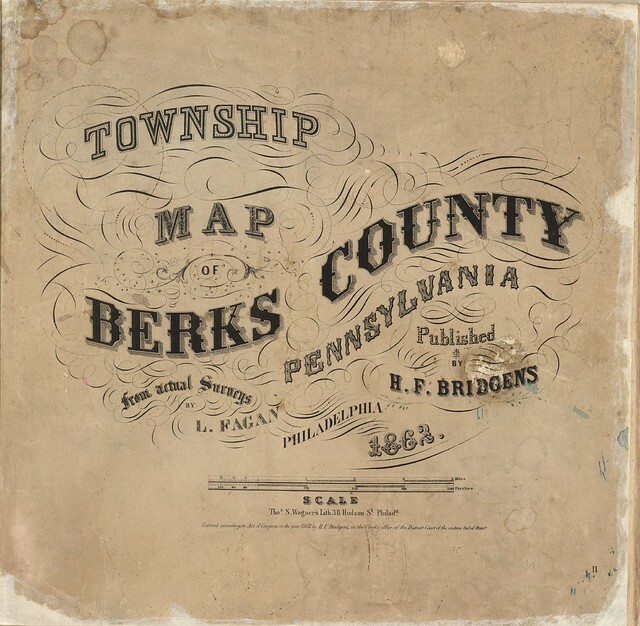 Township Map Of Berks County Pennsylvania from actual Surveys By L. Fagan, Philadelphia 1862. Published By H.F. Bridgens. Thos. S. Wagner's Lith. 38 Hudson St. Philada. Entered ... 1862 by H.F. Bridgens ... Penna. Atlas Of Franklin County Pennsylvania From actual Surveys under the direction of D.G. Beers. Published by Pomeroy & Beers, 320 Chestnut Street, Philadelphia. 1868. Engraved by Worley & Bracher, 320 Chestnut St. Phila. Printed by Fred. Bourquin, 320 Chestnut St. Phila. 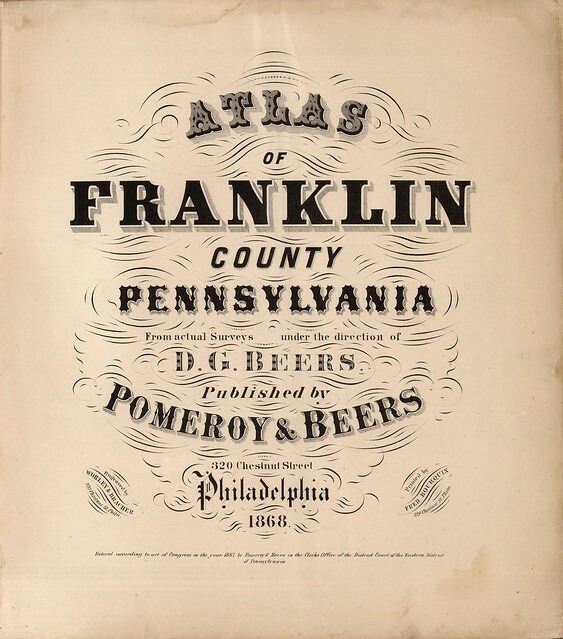 Entered ... 1867 by Pomeroy & Beers ... Pennsylvania. 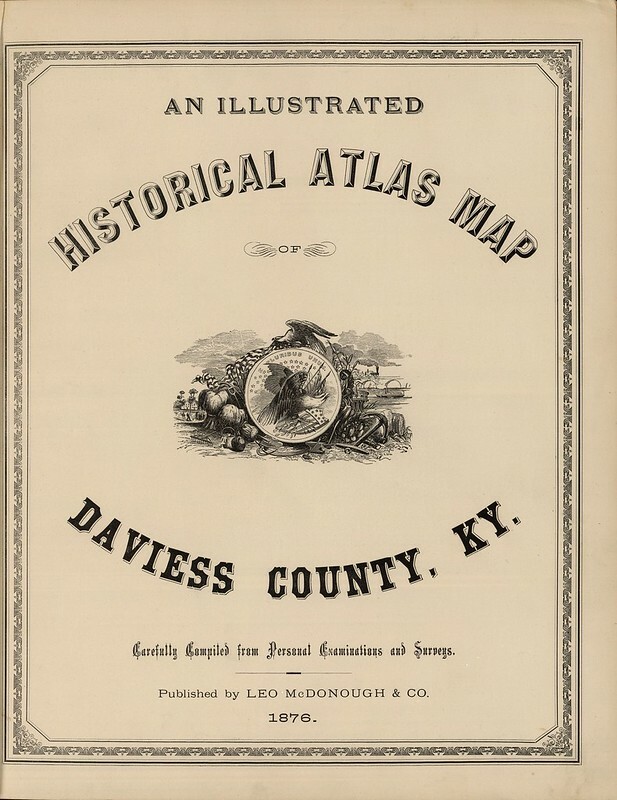 An Illustrated Historical Atlas Map Of Daviess County, Ky. Carefully Compiled from Personal Examinations and Surveys. Published by Leo McDonough & Co. 1876. 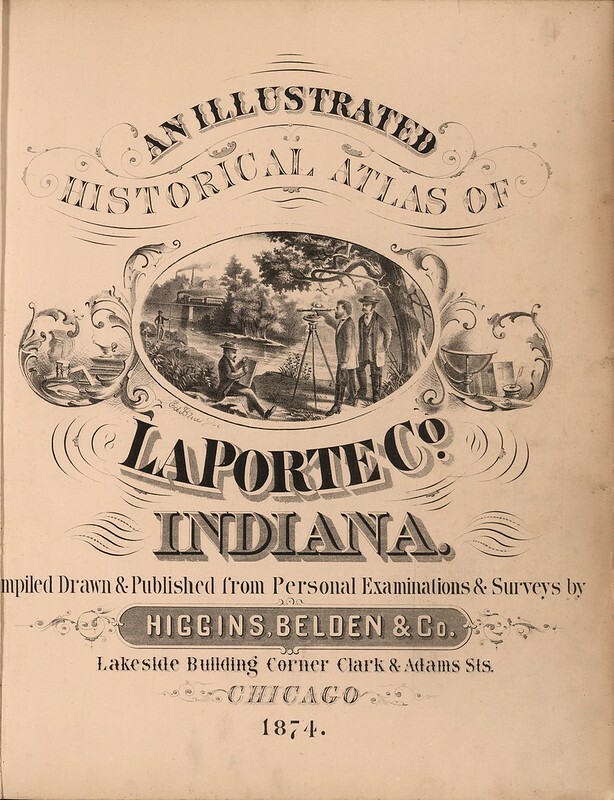 An Illustrated Historical Atlas Of LaPorte Co. Indiana. Compiled Drawn & Published from Personal Examinations & Surveys by Higgins, Belden & Co. Lakeside Building Corner Clark & Adams Sts. Chicago. 1874. Ed Blue Del. 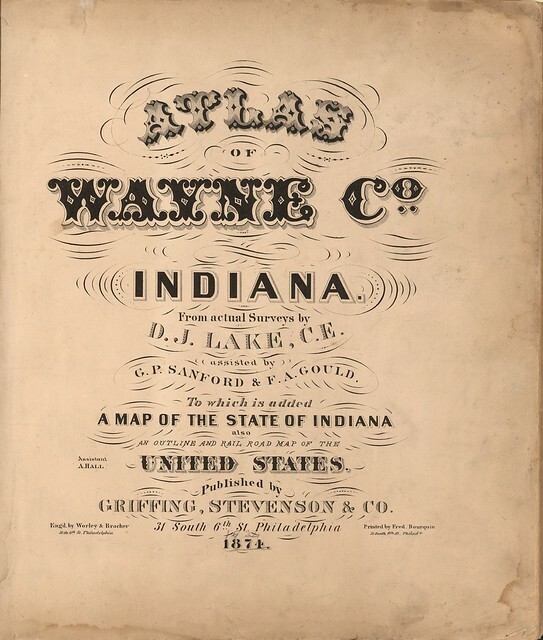 Atlas Of Wayne Co. Indiana From actual Surveys by D.J. Lake, C.E. assisted by G.P. Sanford & F.A. Gould. To which is added A Map Of The State Of Indiana also An Outline And Rail Road Map Of The United States. Assistant, A. Hall. Published by Griffing, Stevenson & Co. 31 South 6th St. Philadelphia. 1874. Eng'd. by Worley & Bracher, 31 So. 6th St. Philadelphia. Printed by Fred. Bourquin, 31 South 6th St. Philada. 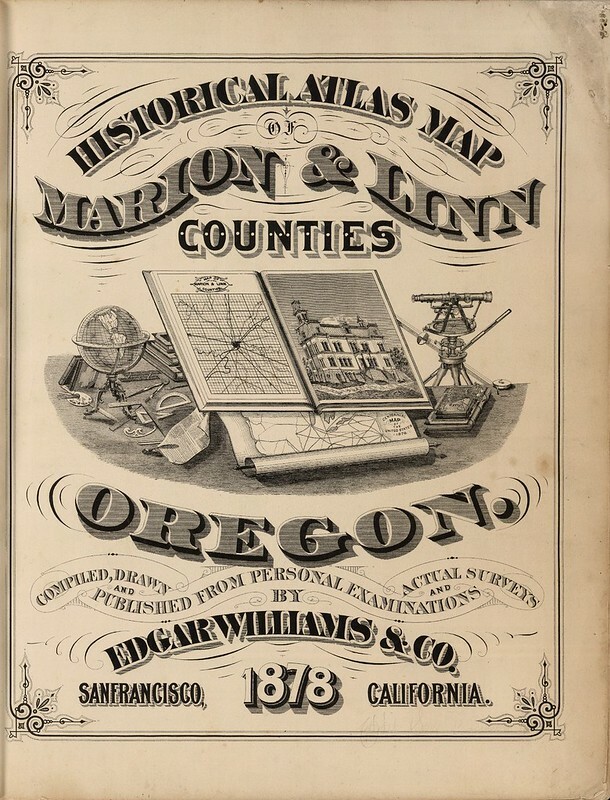 Historical Atlas Map Of Marion & Linn Counties Oregon. Compiled, Drawn And Published From Personal Examinations And Actual Surveys By Edgar Williams & Co. San Francisco, California. 1878. 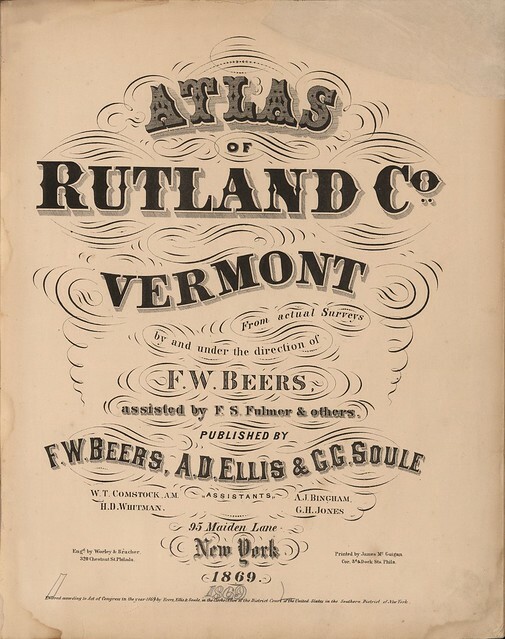 Atlas Of Rutland Co. Vermont. From actual Surveys by and under the direction of F.W. Beers, assisted by F.W. Fulmer & others. Published By F.W. Beers, A.D. Ellis & G.G. Soule, 95 Maiden Lane, New York. 1869. Assistants W.T. Comstock, A.M., H.D. Whitman, A.J. Bingham, G.H. Jones. Entered ... 1869 by Beers, Ellis & Soule ... New York. Engd. by Worley & Bracher, 320 Chestnut St. Philada. Printed by James McGuigan, Cor. 3d & Dock Sts. Phila. 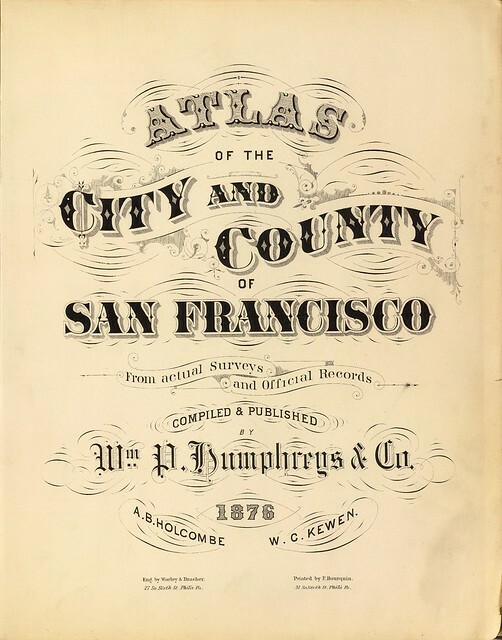 Atlas of the city and county of San Francisco from actual surveys and official records. Compiled and published by Wm. P. Humphreys & Co., A.B. Holcombe, W.C. Kewen. Eng. by Worley & Bracher ... Phila, Pa. Printed by F. Bourquin ... Phila, Pa. 1876. 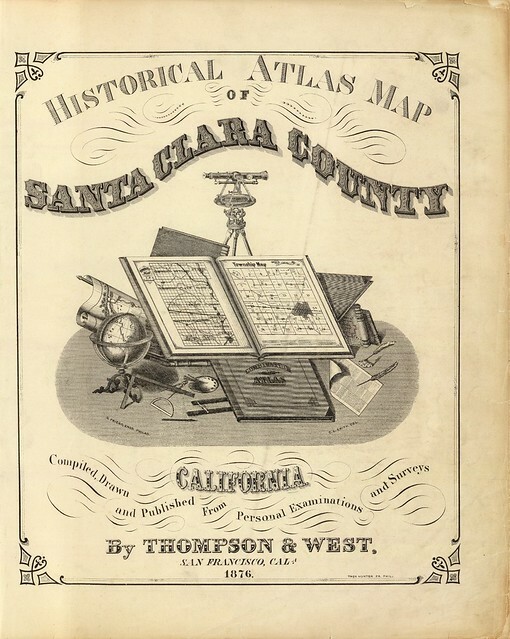 Historical atlas map of Santa Clara County, California. Compiled, drawn and published from personal examinations and surveys by Thompson & West, San Francisco, Cala. 1876. Thos. Hunter Pr. Phil. N. Friend, Engr. Philad. C.L. Smith, Del. 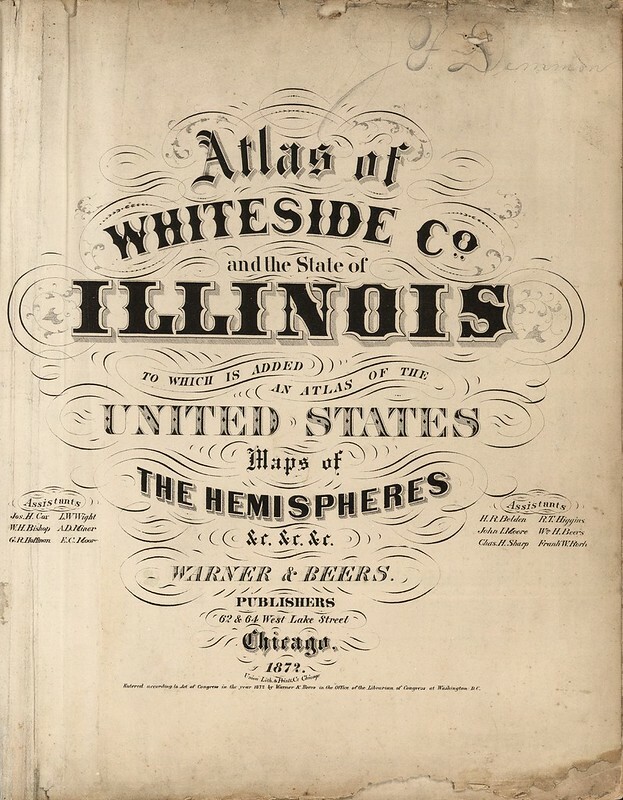 Atlas of Whiteside Co. and the State of Illinois To Which Is Added An Atlas Of The United States, Maps of The Hemispheres &c. &c. &c. Warner & Beers. Publishers 62 & 64 West Lake Street, Chicago. 1872. Union Lith. & Printg. Co. Chicago. Assistants: Jos. H. Cox, W.H. Bishop, G.R. Hoffman, L.W. Wight, A.D. Miner, E.C. Moore ... H.R. Belden, John I. Moore, Chas. H. Sharp, R.T. Higgins, Wm. H. Beers, Frank W. Rorh. 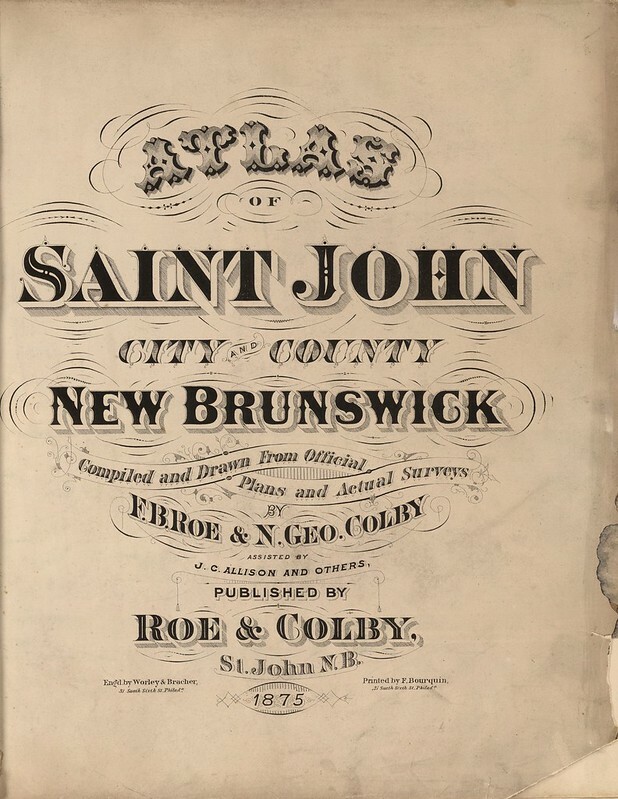 Entered ... 1872 by Warner & Beers ... Washington D.C.
Atlas Of Saint John City And County, New Brunswick. Compiled and Drawn From Official Plans and Actual Surveys By F.B. Roe & N. Geo. Colby. 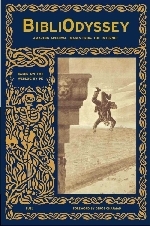 Assisted By J.C. Allison And Others, Published By Roe & Colby, St. John N.B. 1875. Engd. by Worley & Bracher, 31 South Sixth St. Philada. Printed by F. Bourquin, 31 South Sixth St. Philada. The title pages above come from searching around the David Rumsey Historical Map Collection site with various search terms like 'title page' and 'county', as best as I remember. It is a staggeringly fabulous and easily navigable site and, as I think I've said before, the gold standard for large scale hosting of cultural material. Coincidentally, a new batch of more than 1800 map and map-related material was uploaded to the David Rumsey site just this week. I haven't actually had a look through the new stocks as yet: that place is so addictive, I need to pace myself. I owe the Rumsey site such compliments when I consider how many posts over the last nearly-7 years it has inspired and/or populated.